High Hell is a neon-soaked fever dream picked out in black and red. 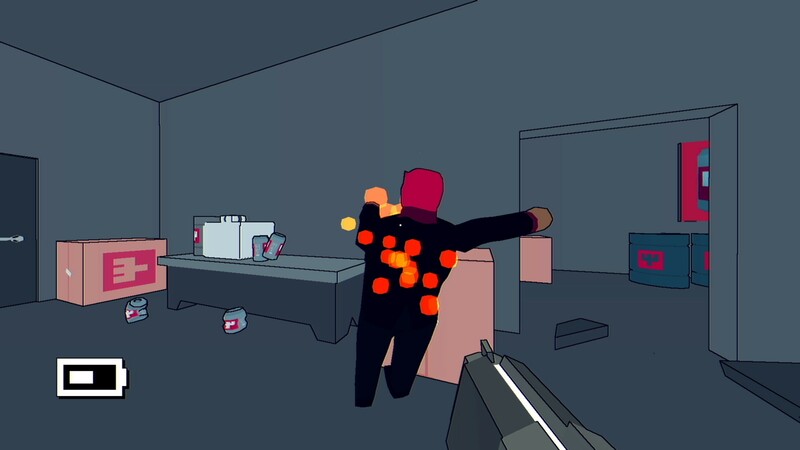 High Hell is the first release of games outfit Beast Cartel and published by Devolver Digital, boasting talent from fellow Devolver titles Enter The Gungeon and Heavy Bullets. 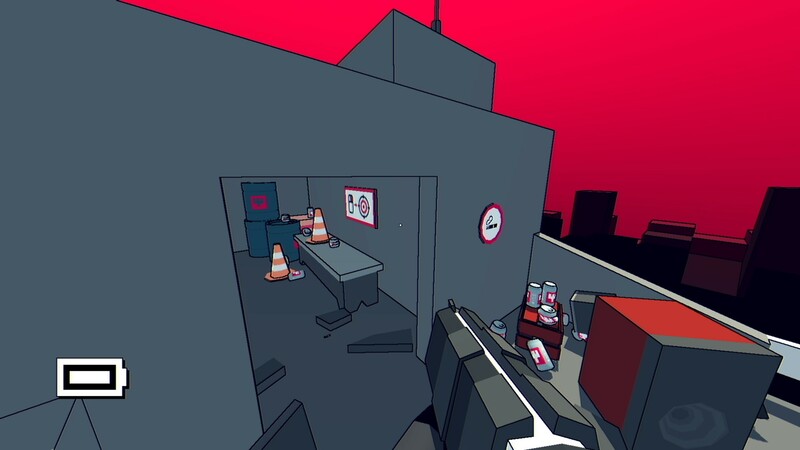 High Hell is a lot of fun, an abstract FPS that has your hero crashing through skyscrapers with a gun and an attitude, splintering doors under your mighty boot and taking out anything that gets in your way, whether that's a demon in a sharp suit, one of their attack dogs, or a monkey under mind control. 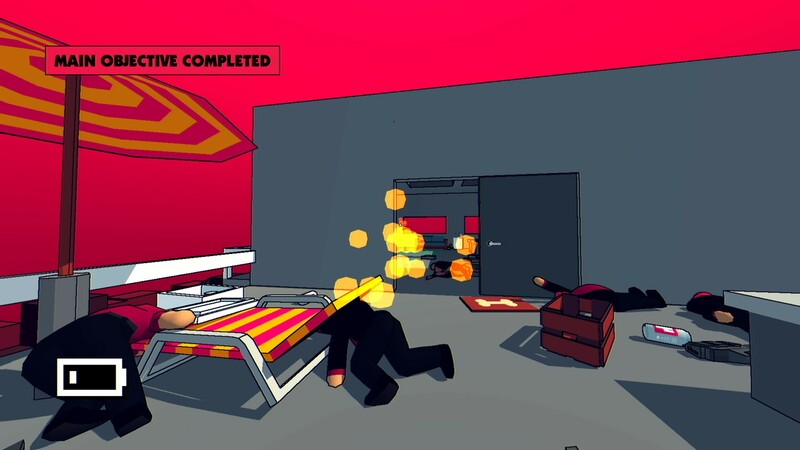 The game is a weird mix of modern game design and retro sensibilities. Your weapon kills in a single shot, performing like one of Unreal Tournament's instagib rifles with a lethal lance of energy reaching out and touching the bad guys. Sometimes you'll fight bosses, who do more damage and can take more hits, but mostly it's one and done for the enemies, and not many more to put you down, either. This creates a sense of difficulty that punishes you for standing still, an old-school sensibility that reminds me of a childhood playing Quake and pirouetting through Doom's myriad arenas dodging fireballs like raindrops. It's a little tougher here as the enemies do not fire projectiles, instead firing similar weapons to yours, laser beams that chip great chunks off of your health and fired just a few seconds after they get a clear line of sight. This means your first shots have to be accurate, and you're often jockeying for position at door frames and stairwells to keep an optimum shooting position. If this sounds like a lot of work, it is, but the game's twitchy combat is one of its real strengths, and it demands your complete attention for the 30-60 seconds each level takes to complete. 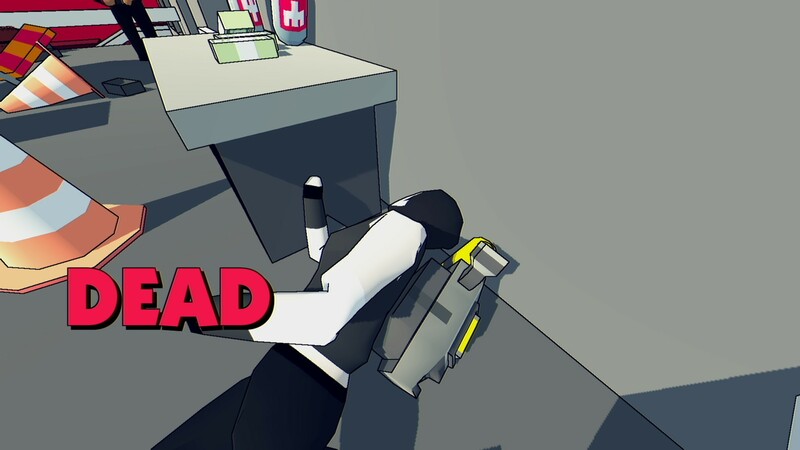 There's a satisfying loop as you start the game, kick down the nearest door and start shooting. 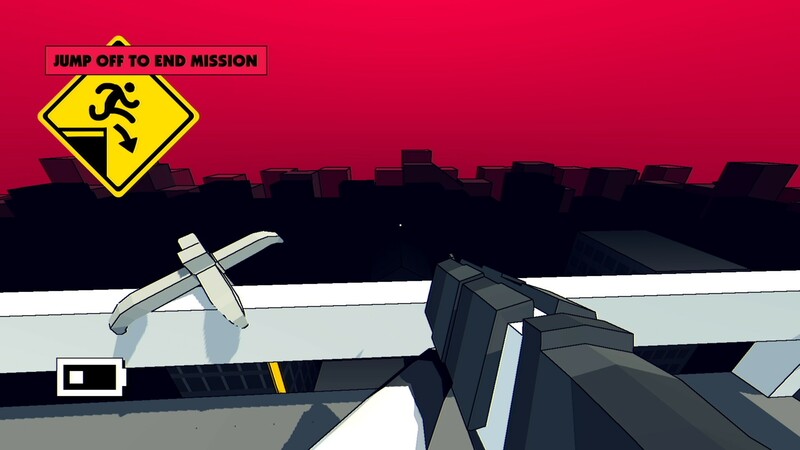 As soon as your objective is done, or if you're feeling completionist and want to hare through the level and kill everyone/collect everything, you finish each level by jumping from the high-rise into the open air, falling to safety. You feel delicate, jinking through the levels trying to desperately survive. Most of your interactions with the environment are limited to violence and destruction. Objectives involve stealing items, burning money, destroying things, or combatting bosses. None of these require much brain power, merely a quick trigger finger and an unholy desire to kill. In this case, this is a strength. High Hell doesn't feel like a game you think your way through; it feels like digitised thrash metal that you experience, ploughing yourself from room to room firing your gun. Mechanics serve the design here in that the primary way to recover health is murder, as you claim the souls of your victims when you shoot them, giving you a small boost to health. No regenerating health means running off to hide won't help you, only efficient slaughter and pushing on into danger. As a mechanic I adore this, but it does mean the difficulty is unrelenting, despite the fact restarting after a failure takes just a few short seconds. The rest of the game is pure personality. Loading screens resemble weird comedy sketches, and the game's art style is interesting, although not memorable. Aesthetically, the game looks as good as it plays in many ways, and for an indie game it's punching above its weight stylistically. Music thumps, bad guys die, and it all has a special cinematic quality, even if the cinema in question is lurid grindhouse. 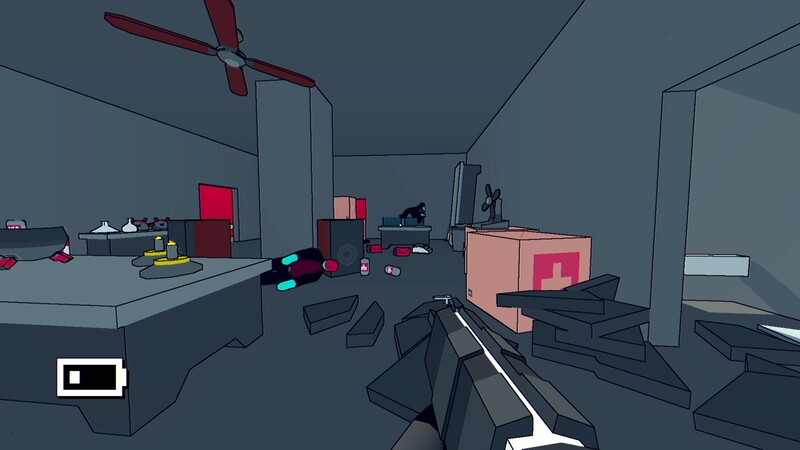 Technically the game has a tiny footprint, and the options are fairly standard, although the addition of a FOV slider, FPS cap, and options to adjust the level of screenshake and camera roll could appeal to purists. Streamers and people who like taking silly screenshots might also appreciate the ability to map your own face to the characters, supported in-game with an option that takes only minimal tweaking, although I found it weird and quickly turned it off. I finished High Hell in an hour, mastering each of its 20 levels in turn, before dipping back into several levels to try and improve my time. All the better to get the achievement for completing the game in under 20 minutes. Unfortunately, it's on a second playthrough that the game starts to show problems. Most of the problem is with the forgettable levels. The levels are unremarkable, corridors, and staircases merging into one another like an M. C. Escher painting of some folk getting shot to death in some corridors and staircases. It's not unattractive - often it's quite the opposite - but nothing really stands out from the red, black, and white geometric nightmare long enough to stay in your memory. There's no specific great level that would encourage me to go back and replay it. Boss fights break up the flow of the game, and while sometimes they're just a slight annoyance, one particular boss made me want to scream after five minutes of constant failure. High Hell is, ultimately, a popcorn game. Consumable as one big bite or several small nibbles, there's not a lot of content here but the game itself is well designed, engaging, and fun. There's very little replay unless you're an avid score chaser, which could sting for the game's current going rate, but if you've got spare cash and not a lot of time, you could do a lot worse. 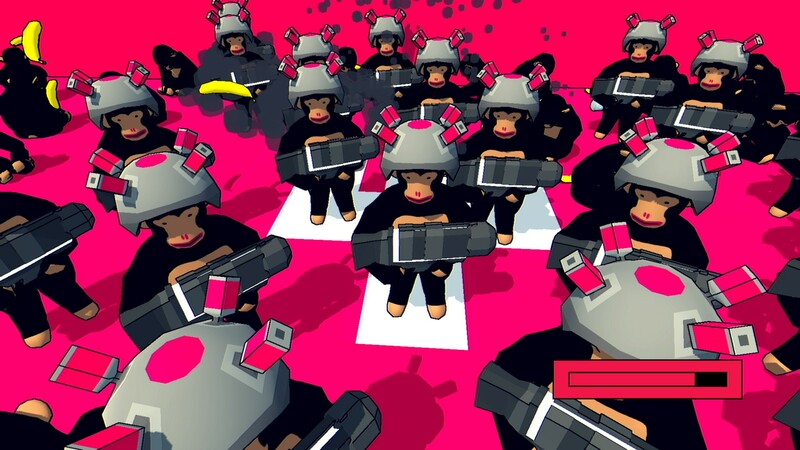 In an age of FPS titles desperately trying to inflate their core concept to unsustainable levels in order to ensure players remain engaged, High Hell is a refresh palate cleanser. Short, fast, and bloody. If you see this going cheap, of course, it's a no-brainer. The ultimate question is how much you think an hour of adrenaline-soaked blasting is worth. This gets a shiny Recommended badge from me, though.